You don’t get many days like this. I’ve been a Red Sox fan since 1973. I became a Reds fan when my family moved to Ohio in 1975, just in time to see my two teams play one of the greatest World Series ever. Yes I cheat by having two favorite teams but it started when I was 7 years old, too young to know that there were rules and I’m far too old to change. And it wasn’t like I was really cheating, jumping on the bandwagon, my two teams had combined to win exactly one World Series since 1919. At 8 years old, I was too young and inexperienced as a sports’ fan to appreciate the Reds’ win in 1975. By ’76 I just assumed that the Reds would win the World Series every year (at 9 years old, 2 years qualifies as ‘every year’). But more importantly, I didn’t appreciate the ’75 and ’76 wins because I hadn’t paid my dues. I had been a Reds’ fan for 2 years and a baseball fan for 4 years and already had 2 titles. I thought that if you were a good boy, ate all your vegetables and cleaned your room, that your team would win the World Series. I didn’t know that teams lost and players made errors. I didn’t know that players got hurt or retired or could just be traded to the Expos for Woody Fryman. I didn’t know that a ball could just pass right under Bill Buckner’s glove and break your heart. By 1990 I was 23 years old and had gained some perspective if not maturity. I had seen the Reds limp through the 80’s. I had lived through the debacle of the ’86 World Series. I knew that my teams weren’t going to go to the World Series every year. Worse, I knew that even if they got there they wouldn’t necessarily win. I savored every pitch of the Reds’ sweep of the A’s, who came into the series absolutely dripping of an arrogance so over the top it would make a yankees’ fan blush. When local boy Todd Benzinger caught the final out I was elated, overwhelmed and, more than anything, relieved. By ’04 I had a firm grasp on who the Red Sox were. I had always known their history - 1918, the curse of Babe Ruth, the 4 losses all in 7 games – but at 37 years old I didn’t just know their history, I had lived it. 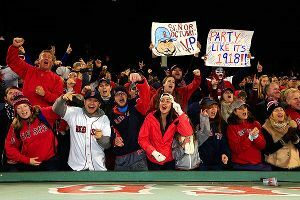 Every Red Sox fan knew that not only would they lose but they would do it in the most excruciating way possible. Going down 0-3 to the hated yankees was a nice change of pace - lose fast, nice and clean, get on with our lives. But then they started winning, not just winning but doing it in such spectacular, incredible ways that if you had put it in a movie script you would have been laughed out of Hollywood. I bought the DVDs of that series would probably be committed to a nut house if I admitted how many times I’ve watched them. After winning those final four over the yankees, the team had a different feel. They could actually win, and they did. The 4 game sweep of the Cardinals was somewhat anti-climactic but still sweet. An extraordinary end to an extraordinary drought. I would be lying if I said that ’07 was as sweet as ’04 but that doesn’t mean it didn’t have meaning. A 2nd title in 4 years meant that they belonged, they weren’t a fluke, they weren’t the ’69 Jets. Now we could talk about the teams of the 2000’s, not just the one-off win. That brings us to tonight. This one still isn’t on the level of ’04 but after the 2012 Valentine’s year massacre it’s pretty spectacular. More importantly, the season is over and my team, ok one of my teams, is the only one left standing. This is why we do it. All of us neurotic, obsessive, often childish sports fanatics who live vicariously not even through the players but the uniforms that they wear, because players come and go but the uniform represents the team and the team represents us. Every time we throw something at the TV, scream into an empty room, curse the player, coach, general manager or sports’ gods themselves, it’s because they haven’t done everything in their power to get us to this day, the day our team wins the championship. Because as sports fans, this is all we have. Yesterday it was just a dream, tomorrow the offseason begins, but today my team is the World Series Champion. As I said, you don’t get many of these and every Red Sox fan knows that an 86-year drought can start tomorrow. I don’t follow basketball or hockey and my football team has never won it all. 1975, 1976, 1990, 2004, 2007, 2013. That’s it. I’ve had 6 days like this in the 16,864 days that I’ve been alive and I’m going to enjoy it cause there’s no guarantee that I’ll get a 7th. This started out as a post and just got completely out of hand. I realize that it's too long and completely self indulgent so just pretend you read it. I promise you won't have to hear me talk about the Red Sox for at least the next 12 hours. Congrats Andy. You deserve to talk. I'm just looking forward to my day. I was 1 when the Pirates last won a WS. There will be no championship that can mean more to than that one. For 20 years, that has seemed like more of an unattainable dream. But in watching the Sox celebrate, for the first time in a long time, I had the legit feeling that next year, that could be us. I don't talk about much in sports in terms of "we" and "us", but with the Pirates, that's how I feel. Looking forward to the day where that's me. I'll have no idea how to react. I was a front-runner as a six year old as well. I have family on Long Island and lived in Ohio, but the Bears were the first team I followed and Walter Payton was the first player I idolized in any sport. Of course, I fear that I won't have any adult championships with the Indians, Mets, Bears, Cavs or Islanders. I desperately rooted for the Sox in 2003 and 2004 when they played the Yankees. I think I have watched games 4 and 5 against the Yanks more times than I have seen the DVDs I have from the Mets season; other than game six, of course. 2007 was sad for me. As an Indians fan, I thought that team would have crushed the Rockies that season. October 21, 2007 was a weird day for me. I was in Philadelphia to see the Bears get a comeback win against the Eagles and saw the Game 7 loss (Matsuzaka v. Westbrook) in a hotel bar. I took a red-eye back into work in the morning. I won't forget that series because the Indians were up 3-1 and had Sabathia going in Game 5 and the formerly-named Fausto Carmona going in Game 6. The Indians lost the last three by a score of 30-5. Carmona never was the same, and, as we know now, never was Carmona. I am happy for the Sox in that Ortiz was so big for them and so good after the bombing. Colin Cowherd tried to douse the joy with negativity yesterday by bringing up Papi's age and baseball's history of PEDs. To that I say: So What? Good for the Sox and good for Big Papi. I pretended to read almost all of it. Congratulations on something. Congrats on the Red Sox' big win. By the way, does Ortiz' new connection get a ring as well? I'm like you Freeland. I went to my first Reds game when I was 2-3 years old back in 89, 90. I can't remember exactly when I started being a Reds fan, just always have been. However when I was 6-7 for some reason I liked playing with the Red Sox on Tecmo Super Baseball even though they weren't very good. Every since then I have rooted for the Red Sox as well as the Reds. Always Reds first, Red Sox 2nd. It would have been easy back then to become a Mariners fan, seeing as Griffey was my favorite player of all time, but for some reason the Red Sox called to me I guess. 2004 was magical. It's the only championship I can remember one of the pro teams I root for winning. The Reds haven't since 1990 and the Bengals just haven't, though I have seen UNC win a few in basketball so I have had something. I went to a Reds Red Sox game in Cincy a couple of years ago wearing a Reds shirt and a Red Sox hat. It was a close game, game tying homer by Edwin Encarnacion with 2 outs in the 9th. I was actually a little surprised to find myself rooting for the Reds. So I'm also a Reds fan first and Red Sox second, but it's a very, very close second. After Griffey, Ortiz is probably my 2nd favorite player of all time. Though Bruce and Philips are catching up. I also feel like I'm really going to enjoy watching Billy Hamilton when they bring him up. 6 is a really high number. Most fans would kill for 6. You've been very fortunate. As I've learned since Roman Abramovich bought Chelsea Football Club, it's good to be rich. Rich teams win things. Still, as you say, in the span of a lifetime 6 isn't that much. That's one reason why titles are so special. I almost jumped out of my skin when John Riggins bashed through a tackle and sealed the Redskins' first Super Bowl win. In some ways I still don't believe that Chelsea won the Champions League. I really don't know what being a sports fan is fundamentally about. I do know that many of us invest far too much into it. There was a time when the lows were unbearable. I had to cut that out. Doing so also took the top of the highs, unfortunately, but made me a happier person. A trophy is validating. It bolsters the weak self esteem that almost all of us harbor somewhere within our psyche. But it's also like the toy in the window or the gadget on Amazon: It has more power when it's just out of our reach. Once we actually own it, it's somehow diminished a little bit and our eyes begin to wander almost immediately. Funny thing, that.